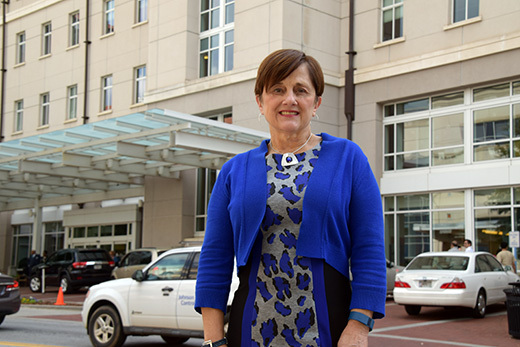 Winship Chief Administrative Officer Diane Cassels retires after a 24-year career at Emory. Winship Chief Administrative Officer Diane Cassels will retire this week after a 24-year career at Emory. Cassels has served in a number of leadership roles since joining Emory in 1992 including Chief Department Administrator for Radiation Oncology and Administrator for The Emory Clinic's Section of Radiation Oncology from 1992 through 2015. She was the Chief Operating Officer at The Emory Children's Center and Department of Pediatrics from 2002 through 2006. "Diane has had an extraordinary influence on Winship and Emory during the past 24 years. Her service in a number of significant administrative roles will leave an indelible mark on our organization," says Winship Executive Director Walter J. Curran, Jr., MD. Cassels was named Winship's Executive Administrator in 2010, transitioning to Winship's Chief Administrative Officer in January 2016. Under her guidance, Winship doubled its clinical footprint and clinical patient volume, expanded its membership from 268 to 434, and expanded the infrastructure for the conduct of clinical trials and laboratory research.